Weddings, Corporate Events & More. 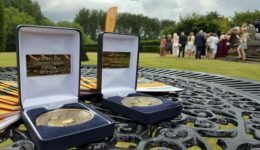 Laser Clays Entertainment Ltd supplies a fascinating, addictive, fun and safe form of the skilful sport of Clay Pigeon Shooting or alternatively their Smart Target Indoor Shooting System. Laser Clays Entertainment Ltd is happy to attend events countywide. 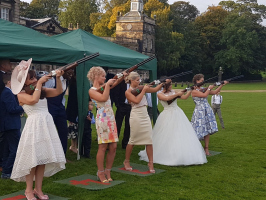 Laser Clay Pigeon Shooting is becoming one of the most popular participation activities for weddings, corporate events, private parties, fundraising events, agricultural shows or just about anything that requires group entertainment. It can be enjoyed by everyone almost anywhere – adult or child. Laser Clays Entertainment Ltd supplies and operates either system at your location, you do not need to come to us. 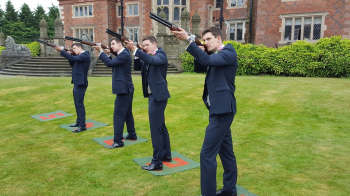 Laser Clays Entertainment Ltd has fully trained operators who will quickly get you hitting the clays or the indoor targets. It is an addictive form of activity which will get you competing with the others in the group. Each person has a modified real shotgun that fires an infrared beam. It is completely safe. You shoot at modified clays launched from a clay launcher outdoors or at the targets as they light up indoors. Given enough room the outdoor system can also be used indoors. 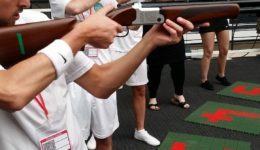 When the shotgun trigger is pulled, the digital scoreboard generates the shotgun sound effect and if the clay or target is hit, the sound of a breaking clay is produced. 100% authentic, except no kick-back, its safe and we can operate in confined venues. 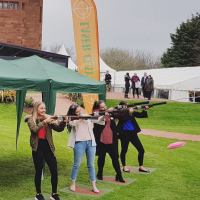 Laser Clays Entertainment Ltd provides fully insured and risk assessed entertainment..
Make your event extra special with Laser Clay Pigeon Shooting or the Smart Target Indoor System. Hire Laser Clays Entertainment for your special event and we'll do the rest. 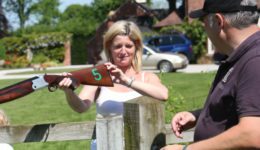 Laser clay pigeon shooting - a game suitable for both adults and children. Feels like a real shotgun but has none of the dangers. 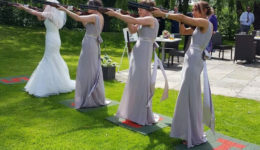 Unique and fun entertainment for the guests at your wedding.